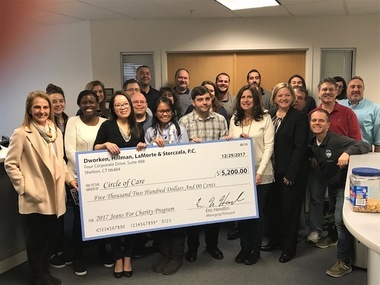 On Friday, January 19, 2018, DHL&S presented a $5,200 check to the Circle of Care Foundation based out of Wilton, Connecticut. This foundation provides support for children with cancer and their families. Thanks to our Jeans for Charity Program, employees have an option to make a small donation in exchange for wearing jeans on Fridays. At the end of the year, the Principals match the amount employees donated during the year. Employees also get to vote on the local charity they would like to support. This program empowers our firm and our employees to come together, give back and make a difference!